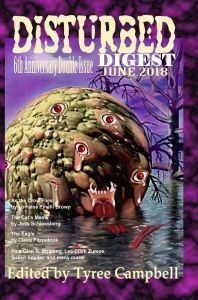 You are here: Home » GENRE » Fantasy » Disturbed Digest June 2018 (e-mag review). Disturbed Digest June 2018 (e-mag review). As with ‘Bloodbond May 2018’, I bought ‘Disturbed Digest June 2018’ in the Smashwords summer sale for a mere dollar, so it’s good value financially. It’s good value artistically, too. The opening story is ‘As the Crow Flies’ by Lorraine Pinelli Brown. Set in the American corn-belt, it’s about Isaiah, a good ol’ boy who drinks beer and whiskey and slaps the wife when she needs it. Sara needs it often as she’s a weird girl who seems to prefer bunny rabbits and deer to him. It was her father’s farm. The corn is growing tall and nearly ready for harvesting when a crow starts to pester Isaiah. An atmosphere of menace was successfully evoked and the ending satisfied. This would have fit well into the ‘Black Feathers’ anthology I reviewed recently. The author should keep her eye out for a follow-up. ‘Tres Mal’ by Paul Lubaczewski opens dramatically with a woman being pulled through a doorway into what might be Hell and a man desperately holding onto her hand to save her. Then he realises he’s going in, too, and lets her go. Cut to Laura getting a new job as shop manager of a little boutique on the Lower East Side of New York where strange things happen in the basement. But that area is full of strange things according to Devin Morgan, Purveyor of Rare and Unique Books. It ‘drove Lovecraft back to Providence and Poe back to Virginia’. Devin investigates the phenomena for her. This was terrific, too, and Devin Morgan would make a fine series character. ‘The Key Of Love Or Lovesick’ by Robyn Groth features a farm labourer passionate about music. He builds his own instruments and plays them but his style is too unusual for him to be accepted at auditions. Persevering, he takes extreme measures to make an impact. This is one to pluck at the heartstrings and far out, even for fantasy. However, it was well done and the main character is a nice guy. ‘The Blight’ by Will H. Blackwell Jr. is absolutely crazy. A story of scheming, sentient Irish potatoes written in 19th century prose (with plenty of asides in brackets), it’s probably the maddest thing I have ever read. It’s set on a potato farm in Idaho and the reader will finish it much wiser about the nature and history of the humble spud. You might even be afraid of them. I congratulate editor Tyree Campbell for publishing this manic gem of Irish lunacy. ‘The Cat’s Meow’ by Jos H Schlossberg had a very slight fantastic element. It was about some artists living in a commune who have a cat and the usual interpersonal problems of the human race. It is quite racy, for ‘Disturbed Digest’ is an adult magazine. There was definitely a fantasy conclusion to ‘The God West Of Kansas’ by Frank Oreto but, mostly, it was a real-life story of divorced Maggie, a child nursery safety inspector, staying in motels and travelling around Kansas. The conclusion was weird but felt sort of tacked on. Both of these were pleasant to read but I confess that ‘The Eagle’ by Claire Fitzpatrick was beyond me. It was certainly a fantasy with a sentient bird narrator that may have been human in a previous life but the prose was so rich and dense and full of imagery that I couldn’t get a handle on the story. No doubt many will love it. All the tales in ‘Disturbed Digest’ are good enough to include in better-known magazines yet because there’s a shortage of short story markets and a glut of good writers out there they appear in an almost unknown small press publication. Life isn’t fair. Hopefully, some of these quality writers will make it to the big time one day. Like many another little magazine publishing great fiction on a tight budget with limited promotional resources, ‘Disturbed Digest’ is worthy of your attention. Disturbed Digest # 19 December 2017 (emag review). « Planetside by Michael Mammay (book review).